Representative Kyrsten Sinema, the Democratic nominee in the Arizona Senate race, wrote a group email in 2006 in which she drew equivalence between the deaths of people trying to illegally cross the U.S. southern border to American soldiers fighting and dying in Iraq. Additionally, when detailing her views on immigration in a profile from 2009, Sinema said, "I oppose all of them [immigration laws]," a stance that appears to differ from the policy positions she currently advertises on her campaign website. Sinema drew the comparison between the deaths of troops to the death of someone attempting an illegal border crossing when addressing a Yahoo! 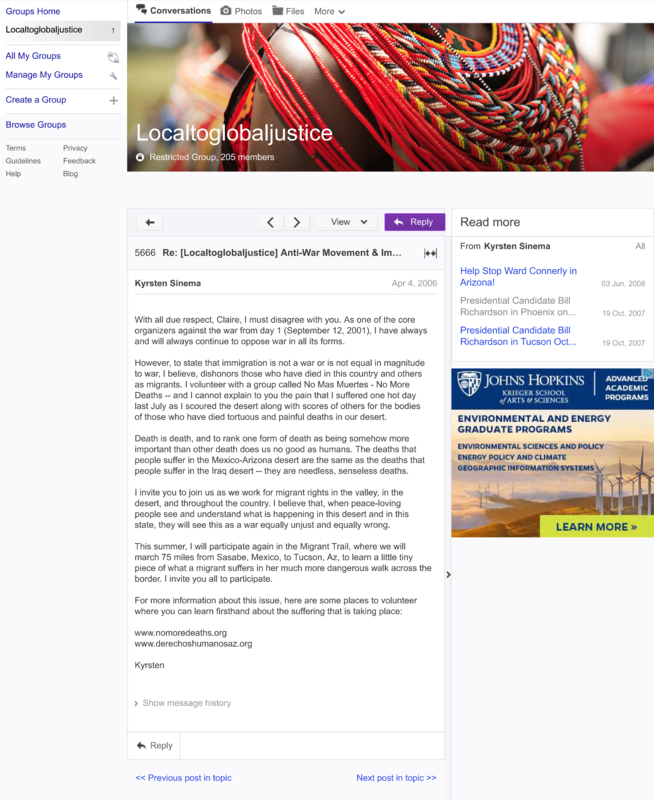 group called "Local to Global Justice." To state that immigration is not a war or is not equal in magnitude to war, I believe, dishonors those who have died in this country and others as migrants. I volunteer with a group called No Mas Muertes—No More Deaths—and I cannot explain to you the pain that I suffered one hot day last July as I scoured the desert along with scores of others for the bodies of those who have died tortuous and painful deaths in our desert … Death is death, and to rank one form of death as being somehow more important than other death [sic] does us no good as humans. The deaths that people suffer in the Mexico-Arizona desert are the same as the deaths that people suffer in the Iraq desert—they are needless, senseless deaths. Sinema's post was dated April 4, 2006, the same day that an Iraqi court charged Saddam Hussein and six other defendants with attempted genocide in 1988 using illegal chemical weapons against the Kurdish population in the northern area of the country. The Bush administration cited the genocide, believed to have killed between 50,000 to 100,000, as one of the justifications for the sacrifice of American lives and treasure in Iraq. 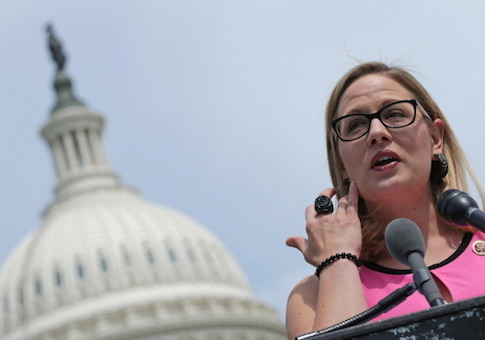 "This should be the final straw for veterans to reject Sinema as a U.S. Senate candidate," said Rick Erikson, a retired United States Marine colonel who lives in the Phoenix area. "To compare the service and sacrifice of American servicemen and women to those crossing our borders illegally is about as insulting as it gets to the families still recovering from losing their son and daughter on the battlefield. This is just one more reason Sinema is completely out of touch on matters of national security and veterans affairs." Sinema's other controversial stance on immigration came during a response to a profile request by a book that details the members of the Arizona legislature, she wrote, "I oppose them all [immigration laws]." "Some are unnecessary; others have simply not achieved their goal." Currently, Sinema's campaign website states that she believes in investing in "smart border security" and "will continue working to fix the broken immigration system so we can keep Arizonans safe." The Sinema campaign did not respond to questions about detailing what dangers Arizonans face under the present immigration system, questions about the Yahoo! post, or her changing position on immigration laws. The Real Clear Politics aggregation of polling in the race shows Sinema leading her opponent, Republican Representative Martha McSally, by about 3 points. One of the most recent polls released from the Arizona Republic in conjunction with Suffolk University showed Sinema leading by 3 points, within the poll's margin of error of 4 percent. Additionally, the poll found 10 percent undecided. Given Arizona's geography, immigration is always a part of the political debate. The debate has only intensified under the Trump administration. President Trump gave a pardon to former Maricopa County Sheriff Joe Arpaio, a long-time anti-illegal immigration stalwart, in 2017. In 2018, the Democratic nominee for governor in Arizona, David Garcia, seemed to embrace the #AbolishICE campaign which was growing nationwide in response to a crackdown on illegal border crossings by the administration. In doing so, Garcia took aim at his opponent, incumbent Republican Governor Doug Ducey. "Trump's immoral actions—which Ducey has enabled—demand that we rebuild our immigration system top-to-bottom and start by replacing ICE with an immigration system that reflects our American values, values I and so many others served to defend," Garcia tweeted. Ducey quickly responded with an op-ed in USA Today, and a columnist with the Arizona Republic called Garcia's moves "a gift" to the Ducey campaign. Early voting in Arizona begins on Wednesday. 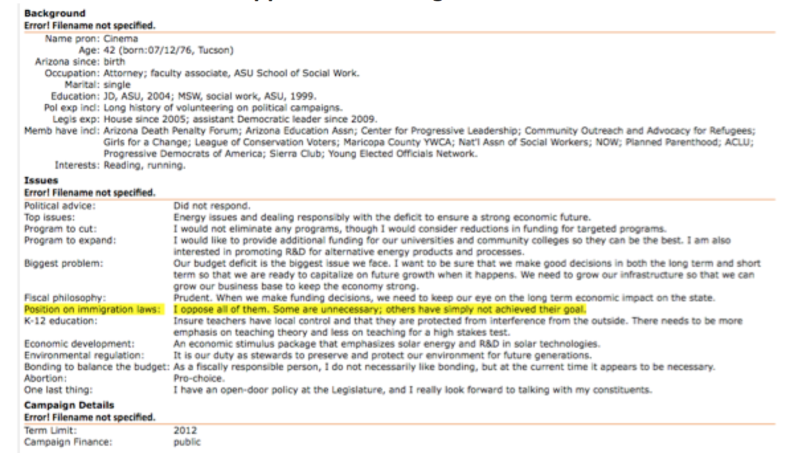 This entry was posted in Politics and tagged 2018 Election, Kyrsten Sinema. Bookmark the permalink.